Posted on January 28, 2019 by admin wrote in Autochartist Blog. It has 0 Comment. If you’ve been trading for a while, you may have noticed something interesting. Of course, you can probably easily recognize a bullish or bearish trend. But have you ever noticed that sometimes the momentum is so intense the trend almost seems vertical? Kind of like the pair is falling off a cliff or ascending like a rocket? The pair moves hard, in a very short amount of time. I like to call those types of swings, vertical trades, whether long or short. In this article I intend to focus on my personal favorite, vertical shorting. Before delving into the technicalities, it’s always wise to first understand the fundamental mechanics behind a trade. First, what causes the market to move in a vertical short? It is a sudden wave of sellers that overwhelms the buyers so much that nothing can stop them. The pair, rather than moving lower in waves, moves lower almost in a vertical line. It’s often true that when the market move down in a vertical manner, shorting at the right time is impossible. Very often, something unexpected has happened. That generally is what leads to a sudden wave of selling. Sometimes, it is a set of economic indicators which have surprised the market. Then, a massive short selling wave begins. On occasion, the piling up of massive short selling is evident just before the burst. And when that happens, it’s the ideal time to ride. Just start shorting and wait for the vertical short to do its thing. What we can see in the EURUSD chart below is what I consider the ideal pattern for a vertical short. That’s simply because it’s perfectly evident and easy to implement, even for traders without years of experience. What are the evident signs? At the beginning of the trend, marked with point A, we can see a regular bearish trade. But, as we move to point B, something quite interesting happens. There is a new sub-trend (marked in blue) with a steeper angle. As we can see, the ensuing waves, rather than reaching the red line at the peak, tend to top out much lower. That is our sign that a vertical trend is coming. Going back to the basics, it can mean only one thing. That is that the volume of short selling is overwhelming the buys. Soon we will have a vertical, falling off a cliff sort of selloff. Just like any trend, timing the exact phase in which you should begin shorting is important. With the right timing, you can maximize your profit and minimize your risk. Some might presume that the right time would be the break of the lower trend line. But that’s not always smart. Usually the break of the lower trend line is so abrupt that, by the time the break is confirmed, the market has moved too far off. Then, you might find yourself risking much more to profit much less. However, if we had started shorting at point C, we could put a rather close stop loss (i.e. risking little) and bank on that vertical short. How would we spot our next point C? My rule of thumb is this: the third time the pair tops out (at our new blue trend line) that’s the confirmation that a vertical short is imminent. Now, that doesn’t necessarily mean that the pair will fall off a cliff right afterward. However, the pair is likely to continue to slide lower anyhow until the burst. So even if the “spark” comes a bit after we are already banking on profits. Finally, before we begin shorting, we need to talk about your stop loss. It’s important to put your stop loss above the higher red line and not the blue line. This way, even if the massive short selling we’re counting on doesn’t occur, you won’t be thrown out of the trade. 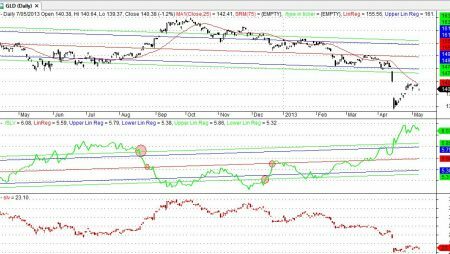 If the pair resumes its old slower trend you could still make a profit, albeit at the much slower pace. As I like to point out, nothing is guaranteed and many times vertical shorts don’t show clear signs. But if they do, you should know how to take advantage of them.